Many of our clients have a common goal in mind: To increase productivity; increase collaboration; and increase attraction and retention of quality workers. To do this, you should start with your physical office environment. Start off by taking a look at your flooring. Your existing flooring is one of the first things your employees and your customers see. Is it sending the right message? 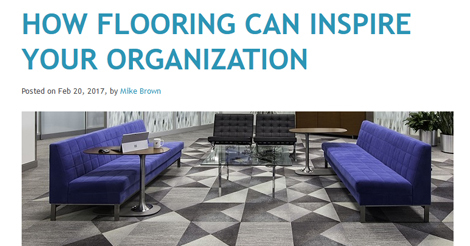 Our partner, Milliken flooring, has three simple reminders on how flooring can influence your workplace – and how the right choice can exponentially amplify your employees’ productivity. This entry was posted in Uncategorized and tagged carpet tile, flooring, milliken, office carpet, office design, office flooring, productivity, vinyl tile. Bookmark the permalink.